The objective of the Legion of Mary is the glory of God through the holiness of its members developed by prayer and active co-operation in Mary’s and the Church’s work. The unit of the Legion of Mary is called a praesidium, which holds a weekly meeting, where prayer is intermingled with reports and discussion. The Legion sees as its priority the spiritual and social welfare of each individual. The members participate in the life of the parish through visitation of families, the sick, both in their homes and in hospitals and through collaboration in every apostolic and missionary undertaking sponsored by the parish. Every legionary is required to carry out a weekly apostolic work in the spirit of faith and in union with Mary. 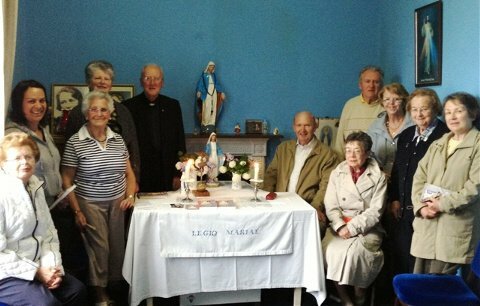 The Legion meet weekly in St. Coman’s Club.